English language is rife with confusing words that pop up while reading here and there. In this post, we catch a pair of confusing word: ingenious and ingenuous. What is the meaning of ingenious? Ingenious is an adjective; it means very smart or clever. Something that is ingenious is very clever and involves new ideas, methods, or equipment. Hackers are finding ingenious ways to hijack phone numbers. This charger's ingenious foldable design allows you to easily pack it up and set it up to charge your phone quickly, all while letting you use it comfortably. He has very ingenious ideas to promote his products. What is the meaning of ingenuous ? Ingenuous means innocent, honest, simple, artless. If you describe someone as ingenuous, you mean that they are innocent, trusting, and honest. The child's ingenuous face made them cry. Being ingenuous all the time may hurt you sometimes. Mind trick: How to learn Ingenious and Ingenuous ? 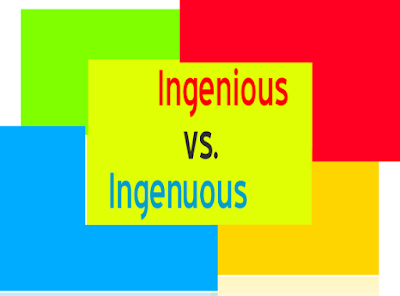 As we know, Ingenious means clever; If you see the word, it has the combination of two words, i.e, "In + genious". Genious looks like Genius; Genius means great intelligence. Ingenuous means innocent like a child. Ingenuous origins from In + Latine word "genus"; genus means birth, something that is new to the world. If something is new, it must be innocent. Generation origins from the same root word, i.e, Genus. You can learn the word Ingenious with the help of Genius. You can learn the word Ingenuous with the help of genus. Ingenious means clever, smart, intelligent. The word genius helps you learn the word ingenious, as both words have geni. Ingenuous means innocent. With the help of Latin word Genus that means birth, you can know the meaning of the word Ingenuous.